Category: Herbal Salves, Skin Care. Tags: buy spruce pitch, buy spruce pitch salve, natural salve, natural salves, pitch, salve, spruce, spruce pitch, spruce pitch for sale, spruce pitch salve, spruce pitch salve for sale. A wild Spruce Pitch Salve infused with hand harvested spruce pitch from Canada’s Northern wilderness. Spruce Pitch is an all-natural first aid product utilized for thousands of years by many First Nations’ groups around the world. It has been said that when applied topically Wild Spruce Pitch forms a protective second skin over wounds helping to heal. Laughing Lichens wild Spruce Pitch Salve is a great addition to your back country supplies when travelling off the beaten path into the remote wilderness. Traditional uses of wild spruce pitch: topical treatment for open wounds and cuts, athlete’s foot, cold sores, burns, rashes and other skin infections such as eczema. Wild Spruce Pitch can be enjoyed by everyone in the family including cats and dogs. As with any new product please test a small patch of skin first to rule out any allergies. Properties: Analgesic, anti-fungal, antimicrobial, antiseptic, disinfectant. I have also put the Spruce Pitch Salve to work. I burnt myself on the oven and immediately starting applying the Spruce Pitch, I was amazed at how quickly the burn healed with little pain and no scar! And it is great for all sorts of scrapes and bruises. If you are at all accident prone like me, try it, you won’t be disappointed! This product is an amazing product!! I swear by this stuff and bring it everywhere with me!! It has so many different uses but healing open wounds is where i got hooked!! I cut my finger open pretty badly on a table saw and used the salve instead of polysporin! After 5 days I showed my dad (who is a doctor) and he said to me “wow you have healed really fast and well, see how well polysporin works!” I told him that I had been using a spruce pitch salve and nothing else and even he was astounded!! I recommend this product to anyone and everyone who wants a natural product that actually works! My son ran into a rope and got a horrible cut on his neck, I used Spruce Pitch Slave twice a day and it healed within the week. I couldn’t believe how well this product works! Now my son won’t have a horrible scar across his neck! Thanks!!! 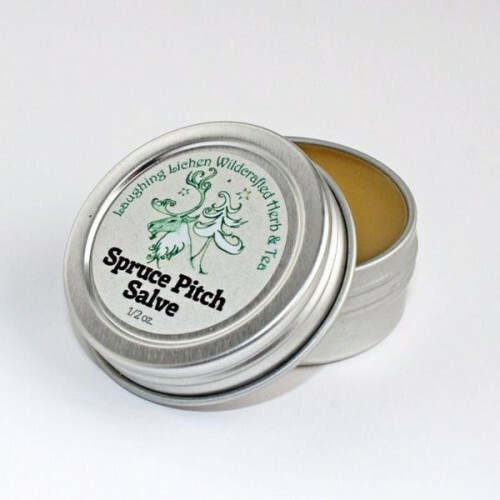 I can’t say enough about the Spruce Pitch salve. I use it on all cuts and I have just discovered is works wonders on a sore, chaffed nose from blowing to much while sick and it smells great! I love love love the spruce pitch salve.